Objectives: Bleeding during pregnancy, especially in the first trimester, is among the most stressful cases for both patients and physicians. 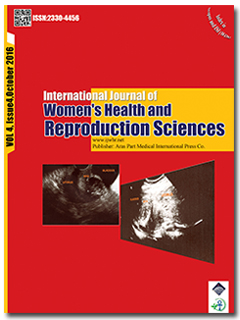 Sometimes bleeding during the first trimester is a predictor of adverse outcomes of pregnancy .The purpose of this study is to document the relationship between vaginal bleeding and preterm birth in patients admitted to the University Hospital in Bushehr. Materials and Methods: The study was conducted on 1045 pregnant women. All relevant information (including age, parity, gestational age, education level, occupation, history of abortion, preterm delivery, smoking, drugs related to the mother’s disease, bleeding, rupture of membrane, mother’s blood pressure and vital signs, and gestational age at delivery) was fully recorded in the questionnaire. Then data was analysed by t test, chi-square, and logistic regression in SPSS version 16 software. Results: There was significant difference between two groups of women with and without pregnancy bleeding (P < 0.05) in terms of risk of preterm birth. The vaginal bleeding of first trimester had no significant relation with second trimester in terms of occurrence of preterm birth (P = 0.115). The vaginal bleeding had no relation with preterm rupture of membranes (P = 0.0001). Conclusion: The emergence of preterm birth increases in patients with bleeding during the first and second trimesters.